Yes, Doris has left the west coast for the east coast but don’t fret: she has studios on both Oceans! Better yet, she has new styles and more “ready-to-ship” costumes than ever! New to the collection is her new design of using more of the body without covering more: her body-bead bikini! This will certainly make you stand out in the crowd! Also, we have brand new samba sandals made by the same cobbler in Rio de Janeiro who makes shoes for all the big samba queens. 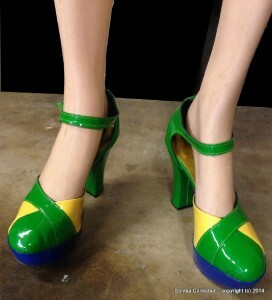 These shoes could not be more Brazilian and have the colors of the Brazilian flag. Finally, check we have over 40 costumes and items ready to ship that can be to you as early as in 3 business days! No more waiting! Since we design everything, we can adjust them to your size. So buy your costume now for the upcoming Holiday season including Carnaval which is closer than you think! From the studios of Doris de Hilster: now in California and Florida!